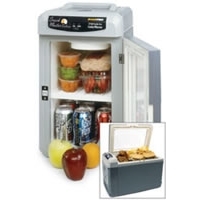 This New Snack Master Deluxe 12V Cooler has been upgraded for better performance and longevity. Snack Master Deluxe 12-Volt Cooler Warmer keeps your favorite food and drinks cold with the super efficient 12-Volt Thermo-Electric design. You can just as easily keep items warm with the flip of a switch! This Family-Size 12-Volt Cooler/Warmer plugs directly into your cigarette lighter socket and uses very little power. With thick insulated walls and a double pane Plexiglas door the interior temp will hold for quite some time. Whether it's life on the road, a picnic with family and friends or keeping fast food warm, the Snack Master Deluxe has it covered. With the 18 Liter holding capacity there is plenty of room for a family size meal or up to 18 12oz. cans. When the Cooler/Warmer has reached the desired temperature, you may unplug the 12Volt power cord, replace in compartment, and take the unit with you. The Cooler/Warmer will keep it's temperature after being unplugged. Wipe the interior with a damp cloth and mild soap. Never use harsh abrasive cleaners. A mild baking soda solution works well. Broke down and quit working right at three month mark! never got real cold anyone did not keep food at temp. just keep it cool not cold. I wanted the Snackmaster Jr. but I'm glad that I bought the Deluxe. This is just the right size for my food, drinks and insulin. All of which are life saving for me so keeping cool is top priority. I've had no problems at all with my cooler and have really enjoyed using it so far. This has been the best portable/mini fridge I have ever had the pleasure of owning. As a doctor I often travel with medication and am pressed for time so I can't always stop for a bite. Not only is time normally in under-abundance for me, but I really don't care to eat what they're cooking. This has kept my healthy food, drinks and life saving medications cool in these hot Texan days for months now without so much as a hiccup. Thanks a Bunch Guys, Dr. Mitchel P.